On June 16, 2015, my Buffy died. She was about five years old. We took her to the ER three times on her last day. Here, during her last trip, she told me that it was time to let go. 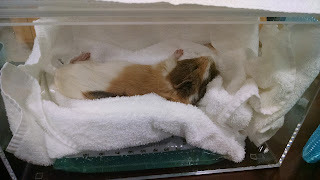 After she died, we asked the vet to do a necropsy to find out what happened. She found that Buffy's right kidney was completely cancerous, and the cancer was spreading along the renal artery. She also noted that Buffy had large ovarian cysts. So, at least my girl was no longer in pain. My favorite shot of my girls at the vet, months before the last time. 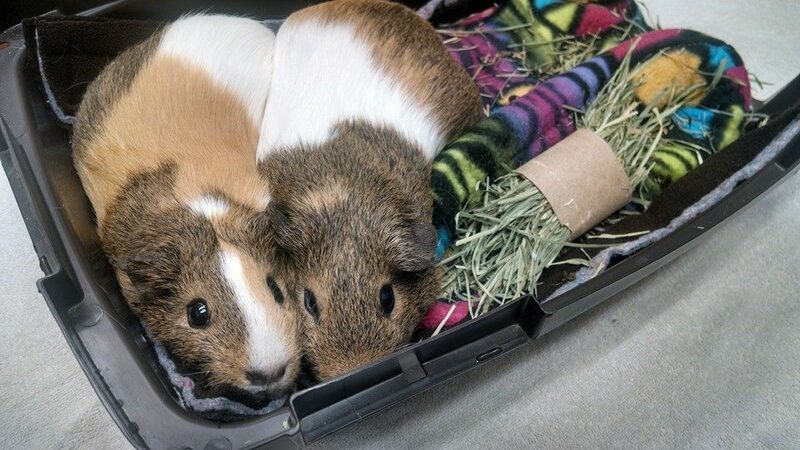 Vet trips were the only times they snuggled. Interestingly, about two weeks before Buffy died, their bond broke. I woke up one day to find Willow being extremely aggressive, with teeth chattering and rumblestrutting, and finally actual flat-out attacking. I noticed that blood had been drawn and took them to the hospital in separate carriers. While there, the vet noted that Buffy's lip was completely cut through, and needed to be stitched. Willow, on the other hand, was completely fine. 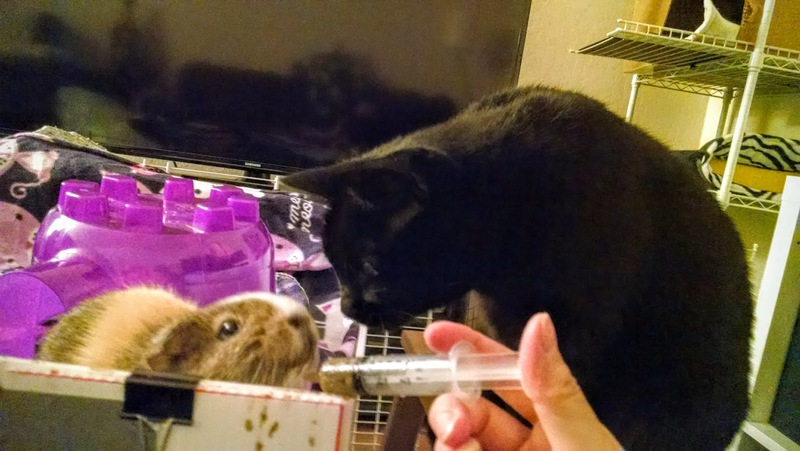 I know that sometimes healthy animals will attack their unhealthy roommates, so I made sure to ask the vets to check if Buffy was ill. They couldn't find anything obviously wrong with her. Normally, stitching up Buffy's lip would have involved using a light sedative to calm her down to keep her still enough. However, apparently the sedative angered Buffy, and she went about biting everyone possible. So, they had to call me and ask permission to anesthetize her. Then, during recovery, she woke up faster than they expected and started biting everyone possible again. They quickly called me and suggested that perhaps I should bring her home already. The vet tech told me that Buffy was a super fighter and very appropriately named. 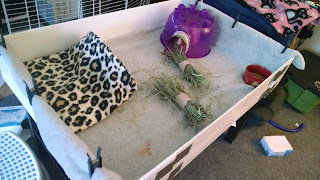 During this time, I had to design a divider for their house. 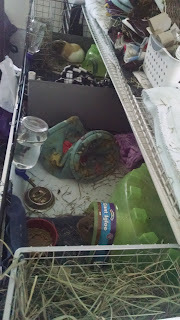 I went to BBB and bought two cooling racks, and used some PVC that I had at home to rig one up. Newly divided house. I had to add a scrap piece of coroplast to block visibility, since every time they saw each other, there was massive teeth chattering. 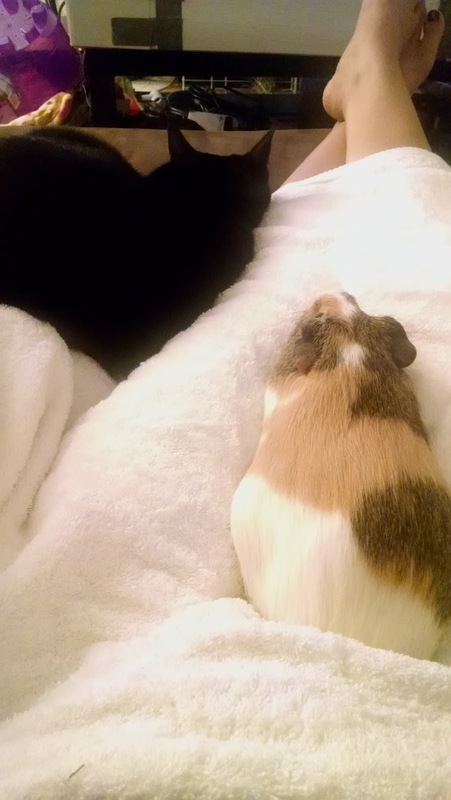 In between ER trips on the last day, I thought it might help if they could see each other again. One last picture together. Buffy died in this sack, so I decided to let her stay there. I'm hoping that in her next life, she is a baby elephant in a safe sanctuary somewhere. She had an extreme love of food, and being an elephant sounds like something she would love. After Buffy died, Willow became severely depressed. She stopped eating pellets, became very sedentary, and dropped a bunch of weight. I tried to help her grief by rearranging her house every day, giving her new toys and stuff to do, and changing up her routine. 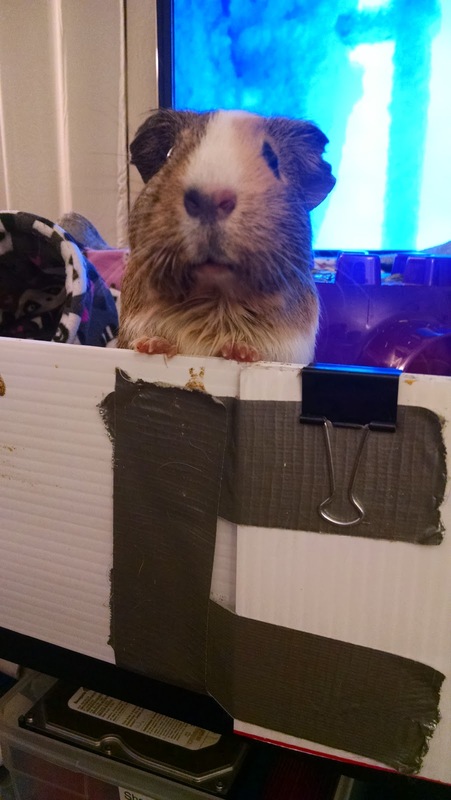 I made her a downstairs pen in the living room, which we call the vacation villa, so she could be downstairs with us in the evenings. We also implemented couch time, where she gets two seats of the couch and I get one. We also tried lap time, but she wasn't the biggest fan of that. This was the cutest thing ever, though. See, she really loves couch time. Possibly because she was so sedentary, she ended up contracting a UTI from being in the same spot for hours. 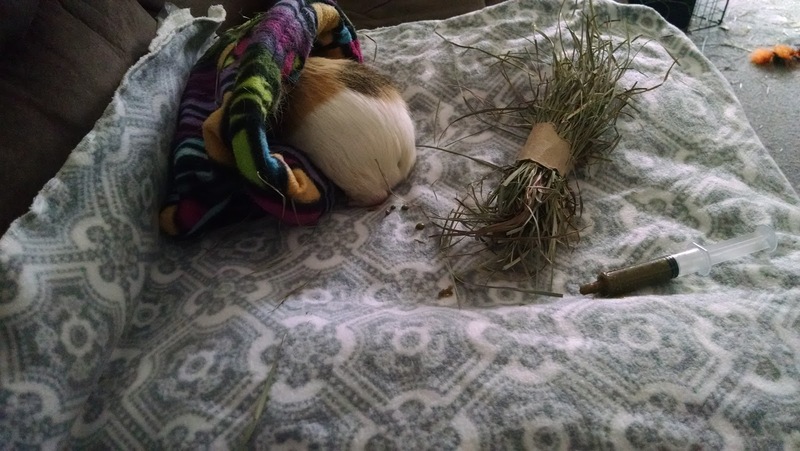 When Buffy was alive, whenever she heard Buffy doing something, like eating hay, she would have to get up and investigate. I tried to emulate this somewhat by randomly getting up and moving hay around, but obviously it wasn't going to be enough. One day, I noticed that she would make a crying sound, which was very obviously different from her regular other sounds, when she was peeing/pooping. Then, I saw that her urine was bright red and bloody. She had had problems with bladder sludge in the past, which had the same symptoms. So, off to the vet. She is not what one might call a cooperative patient. 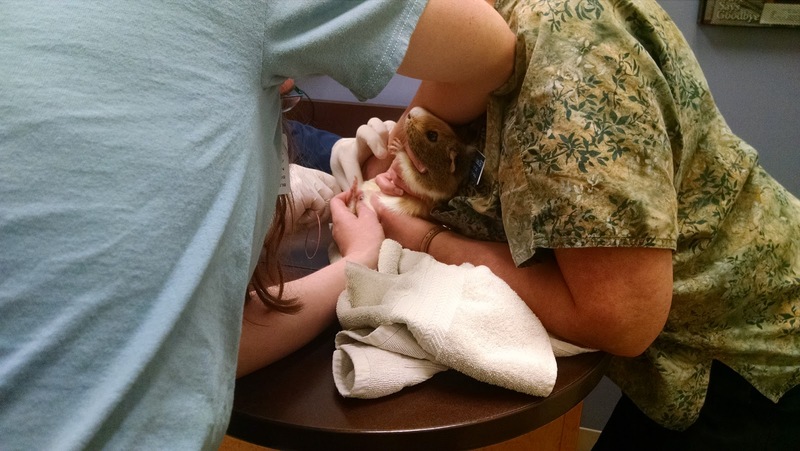 It took two vet techs and one vet to draw urine for testing. Long story short, she didn't have bladder sludge, but had what we called a super UTI from Krypton, because it took about six months of antibiotics, mostly doxycycline, on and off to finally make it go away. 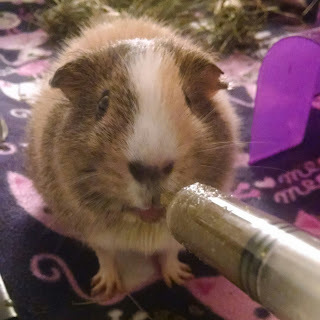 Since she stopped eating pellets and kept losing weight, I realized I needed to give her something to help maintain her weight, especially since she needed the stamina to help deal with the super UTI from Krypton. 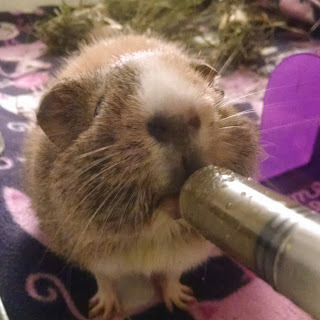 So, I started feeding her Oxbow Critical Care, in the original flavor, which she absolutely LOVES. The first time I fed her, I pulled her out of her house and was all prepared to wrap her up and force feed her, but she actually reached out towards the syringe. Apparently she can be cooperative at times. Now, I just walk up to her while she's in her vacation villa and offer her a syringe, and she takes food. This is what I see when she decides she wants some CC. As recommended by the vet, she also gets highly diluted orange juice, basically to keep flushing out her bladder, which is good for both preventing sludge and helping deal with the UTI. Her little cheeks fill with CC and puff out. She LOVES this stuff. Tribble wonders why no one ever hand feeds her. Less than a month after we ended the antibiotics treatment and she was declared UTI-free, I noticed that she was developing a bald spot on her left side. I observed her for a while to make sure that there were no external causes, i.e. she was not scratching or poking at that spot extensively. She wasn't. 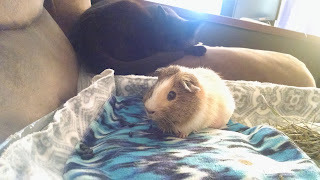 Since Buffy had large ovarian cysts, and the girls were littermates, it was entirely possible that Willow would have them too. 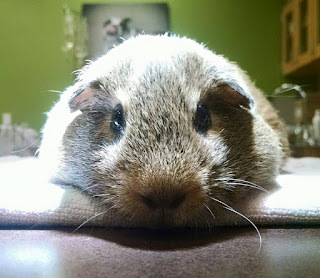 One of the times we were at the vet checking out her UTI issues, I asked the vet, and he said that he could feel that she did have relatively large cysts, about 1"-1.5" in diameter. Knowing this, I consulted the interwebs, pretty much memorizing this page at Guinea Lynx, and kept an eye out for symptoms. One common symptom was hair loss along the side. In addition, she was also often in pain/discomfort, so I started giving her some Metacam daily. So, off to the vet again!! She is not amused. But, at least no one stuck tubes or needles in her this time!! The vet explained that basically, all middle-aged to older piggies have ovarian cysts to some degree, but until there are hormonal symptoms, such as hair loss, or obvious pain/discomfort, they really don't do anything about them. Why? 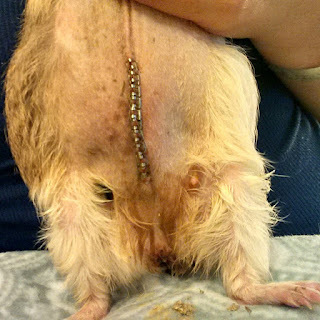 Because the only real treatment is spaying, and spaying is a major invasive surgery. One possible non-surgical treatment is to drain the cysts, which are basically just bags of fluid, with a giant syringe through the skin, but the cysts are likely to return. Fortunately, Willow was a good candidate for surgery. Other than the obvious issues, she was in good cardiac and respiratory health, increasing her odds for surviving anesthesia/surgery. Overall, she looked great for a 5.5 year old piggie. 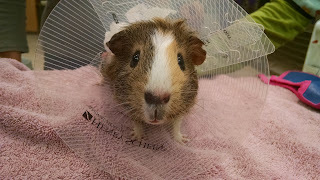 So, surgery was scheduled for a few weeks later, and we continued our routine of giving her Metacam daily and basically just keeping an eye on her. I actually had to go out of town during this, and may or may not have slightly irritated my sweetie with asking about her. I thought it would be good to track her hair loss. There's about one week between each pic. In the top pic, her skin is a bit irritated, but that actually cleared up pretty quickly, and we think it was basically just because it wasn't used to being hairless. Finally, the time came for surgery. Awesomely, our animal hospital is an open hospital, meaning that we could stay with her the entire time except for in the actual surgical suite. 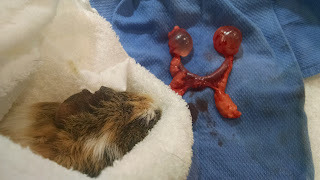 The vet and vet tech were wonderful about everything, and completely supportive of my constant concern and photography. 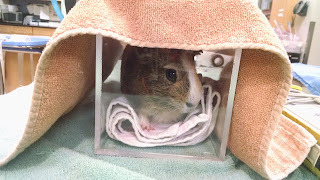 She was put in a box to receive oxygen and anesthesia. This face says it all. After she was out, the tech shaved her tummy. Apparently she has a patch of dark skin on her tummy. I also loved the tiny oxygen mask and the pulse/blood ox clip on her hands that naturally stick straight up when she's out like this. We weren't allowed in the actual surgical suite, but there were windows so we could watch. This is what came out of her. The cysts were about 1.5"-2" in diameter. This is pretty much like two basketballs coming out of us. I may or may not have actually poked the cysts, which were pretty much just membranes filled with fluid. 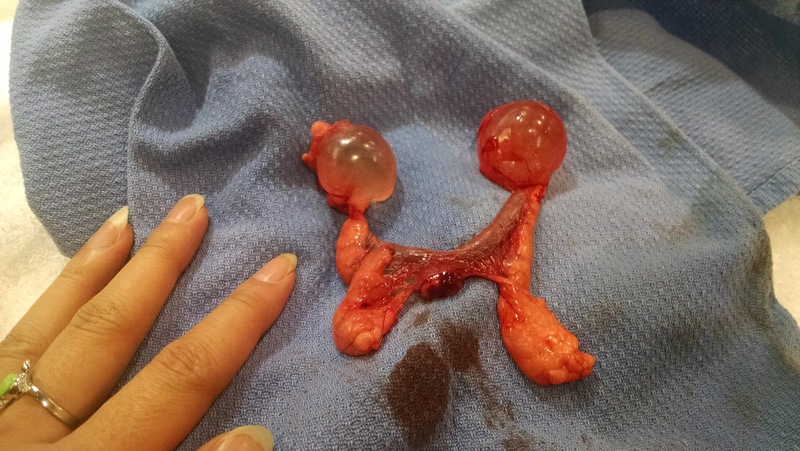 Non-cystic ovaries should be at most the size of a pea. 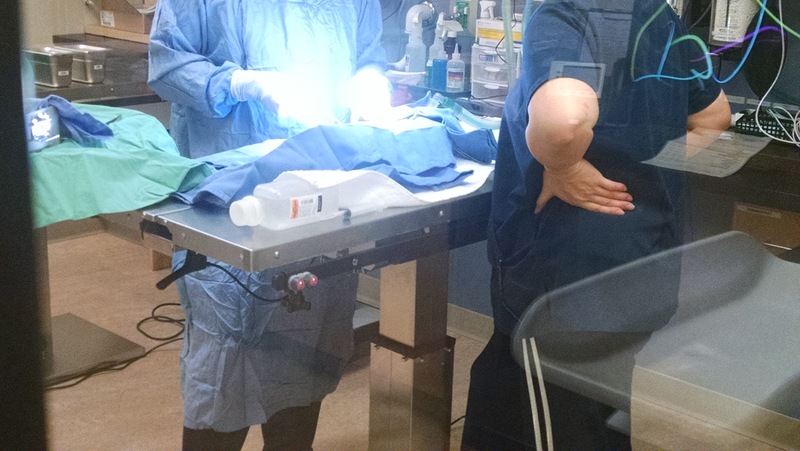 Much of the risk of surgery is actually the anesthesia. She made it through surgery fine, and then came the stress of waiting for her to wake up. 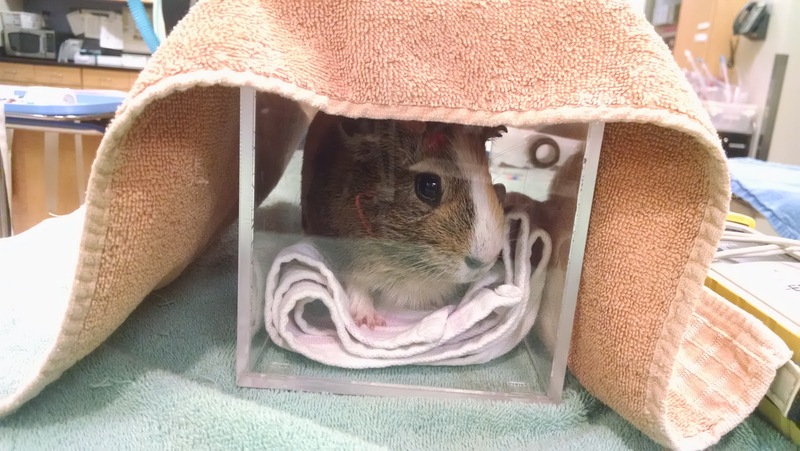 She was put in an oxygen box with warming sacks under her. She was so incredibly comfy. No wonder it took her so long to wake up. Part of the helping her wake up process involved randomly pulling her out of the box and setting her on the table to check her reaction. Let's just say this was probably not too amusing for her. Finally, it was time to take her home and let her rest there. When we got home, I set up a spot on the couch for her, so I could stay within reach of her. She was so adorably groggy and grumpy. Surgery was Friday morning. I stayed on the couch with her all day and night Friday, and all day Saturday. She was willing to eat food I offered her, but she was not yet reaching out to eat food on her own yet, and I was unwilling to leave her alone until she would. I woke up from a nap to see this. 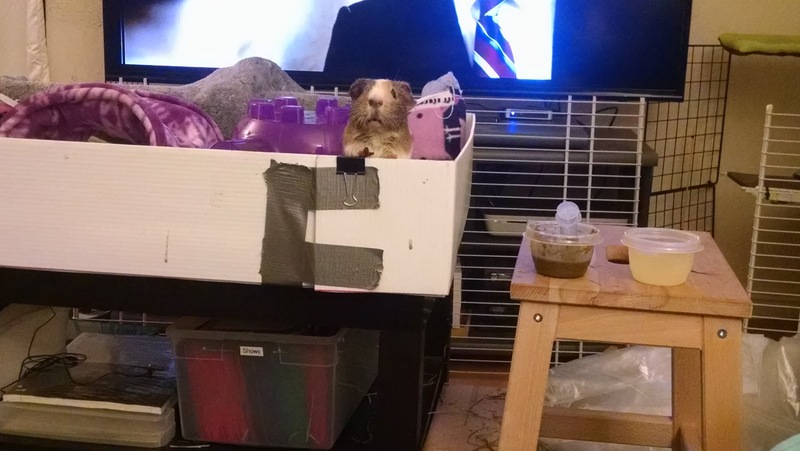 Willow is on a Snuggle Safe. 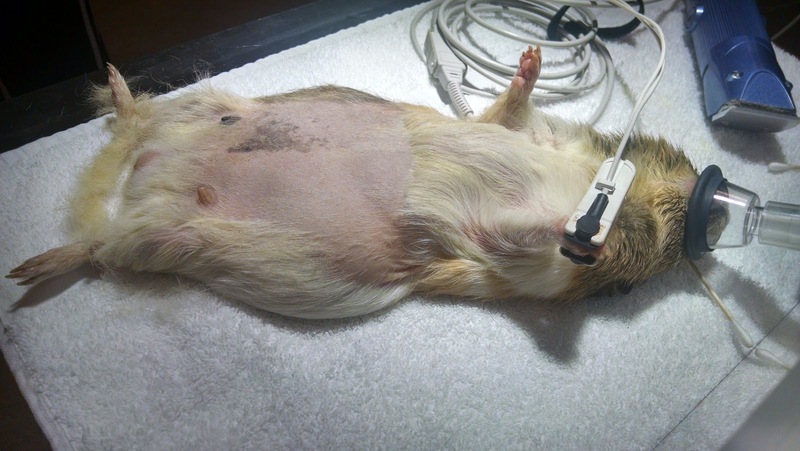 The inner muscle layer was closed up with dissolving sutures, and her skin was closed up with staples. If you thought the story ended here, you would be completely wrong. I went to bed Saturday night, but still got up at least three times during the night to make sure she was eating. When I got up on Sunday, I looked in her house, and saw that there were FOUR STAPLES on the floor of her house. Off to the hospital again!! Her feelings about this are pretty clear. 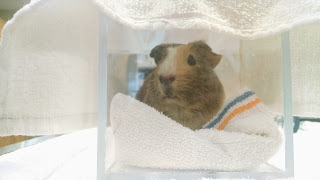 When we got home from the hospital, we put her in her house to recover in peace while we ate lunch. About two hours later, we went to check on her AND THERE WERE MORE STAPLES OUT. Guess where we went next. We tried to put a cone of shame on her. She got out of in approximately ten seconds. 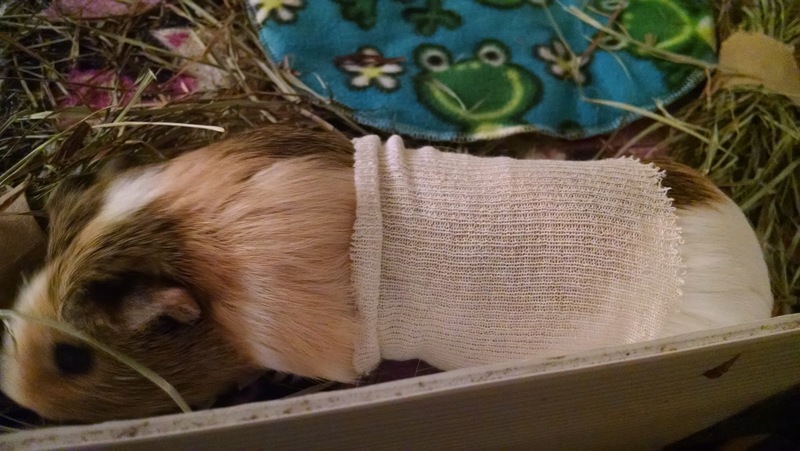 We then tried to put this stockinette gauze tube thing on her. She got out of it pretty quickly. Alright, now it's Monday. Guess what I woke up to. I decided we should try wrapping her with gauze and vetwrap. It did stay on her, but she also managed to move it so it was no longer covering her stitches. Maybe a more full body wrapping job. 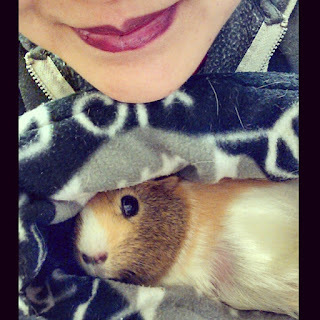 I wrapped her tightly enough that she squeaked. I set her down in her house like this, went to the bathroom, then came back and found her naked again. Last thing to try: wrapping a figure 8 around her arms, like little gladiator armor. This was a bit more challenging for her. I think it took almost two minutes to get out of this one. So, Monday night, we took one last trip to the hospital. The receptionist, vet, and vet techs all recognized us by this point. 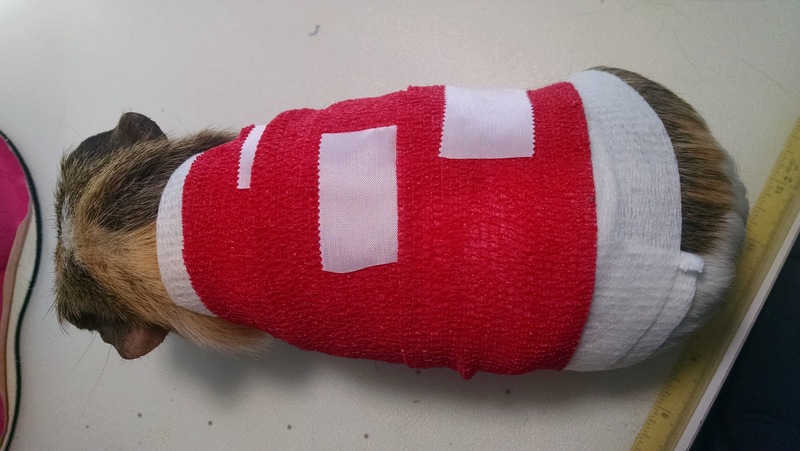 We decided that this was ridiculous, and it was worth the risk of anesthetizing her again to stitch her up. She sure looks thrilled about all this. 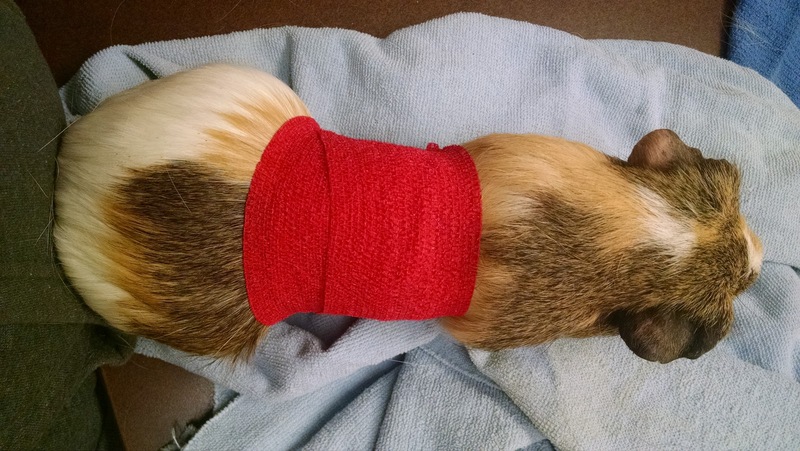 Her skin around the incision was all ripped up from tearing the staples out, so the vet had to cut away all that destroyed skin before stitching. 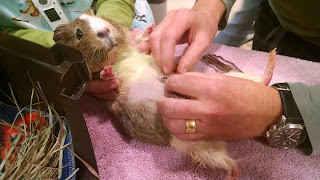 While doing this, he noticed that there was hay in her incision, between the skin and the muscle layer. 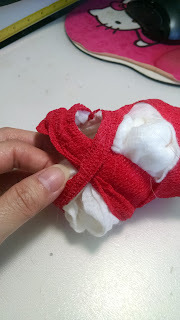 He put in two layers of dissolving sutures as well as one layer of surgical glue. Fortunately, Willow seemed fine with this change in plan. She left it alone, healed up nicely, and is back to her usual self again. There was one day in there where her appetite was severely down, so I had to force feed her some CC, but she bounced back from that quickly. Now that her incision is healed up, I've been giving her piles of hay to burrow in. It's been one month since surgery (she's still recovering from anesthesia in the top pic), and her hair loss is recovering nicely. It's not quite back to normal length, but you can see that it's filling in. 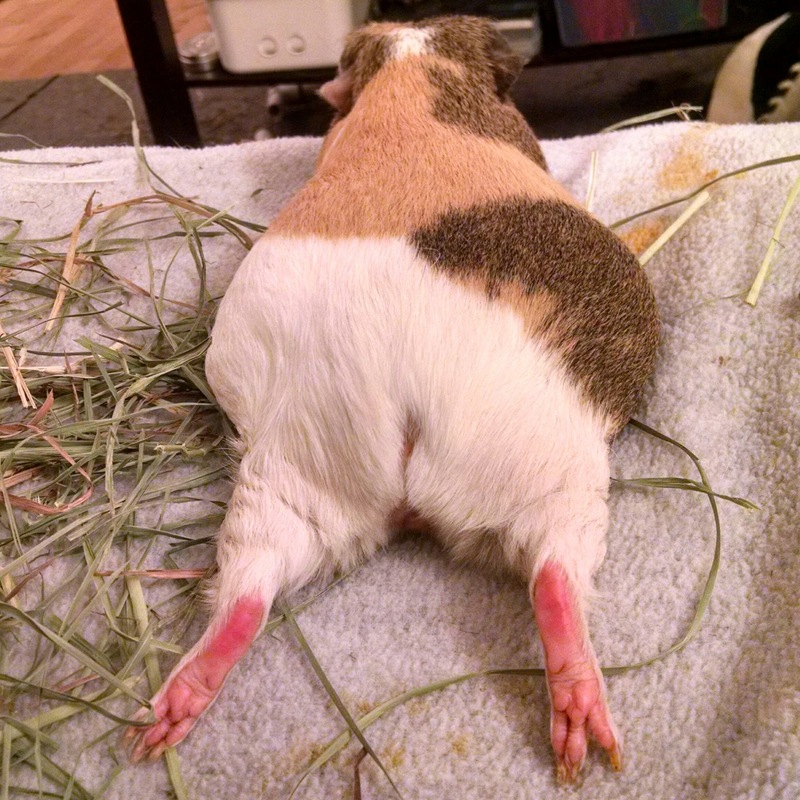 Thanks for reading this incredibly long saga of my uncooperative trouble-making nudist guinea pig. 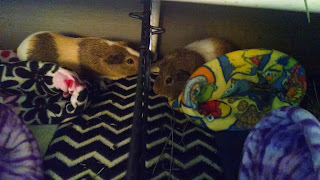 Fun fact: Buffy & Willow are my first/only guinea pigs. They clearly decided that it was important to remind me that everything is a learning opportunity.